H&O Plastics manufactures high quality plastic buckets and pails. Our products use higher quantities of raw plastic material, so they are tougher and last longer than most buckets on the market—particularly cheap containers imported from abroad. We have a large range of buckets and pails in different styles, sizes and colours. We supply plastic buckets both with and without lids so that you’ll always find a container that suits your needs. Our range includes lots of high quality food grade products, UN-approved containers and heavy duty plastic buckets. We always aim to offer a personal service, with a huge range of choice and outstanding customer care. If you have any questions about any of our products or your order, please get in touch and we will help. Call: 0151 639 0002. In the UK, delivery is either by courier, or on one of our trucks for larger orders. UK delivery takes three days if you order before Midday. European delivery is available. For larger orders, you may need to arrange courier transport. Please contact us for more information about European delivery. Call: 0151 639 0002. To avoid disappointment, please contact the team if you wish to collect an order from the H&O site in Birkenhead. Collection should be on business days, and the best time to collect is in the morning between 9 and 12 or in the afternoon between 2 and 4.30. 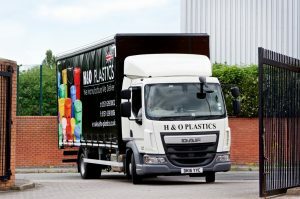 As a manufacturer, H&O Plastics fulfils large trade orders as well as small orders for businesses and private individuals. Significant discounts are available on trade orders. Smaller businesses can also benefit from market leading prices. If you wish to order in larger quantities than are available on this website, then please contact a member of the team. Call: 0151 639 0002 or email: sales@ho-plastics.co.uk. You can find more information about our trade products and services on our trade website. Browse pails and buckets in the products section, selecting your preferred container style from the sidebar. Once you have selected a product, choose the quantity by clicking ‘add to basket’ next to the desired quantity. If, for example, you need 55 buckets then select 1×50 units and 1×5 units. If you need 3 buckets, select 3×1 units. To complete your order and pay, click cart in the top right hand corner of the website. If it is your first-time ordering, then you will be asked to create an account and select billing/delivery details before choosing to pay with PayPal or your card. Once you have created an account and signed in, you will be able to access My Account.